Ever since I found out I was going to be having a little girl, I have had my wishlists and shopping lists filled with cute outfits and visions of pretty dresses and gorgeous hairbands to go with them. With that said, I was ecstatic when the Cute Cute Boutique told me they were going to be sending me some hair accessories for her! 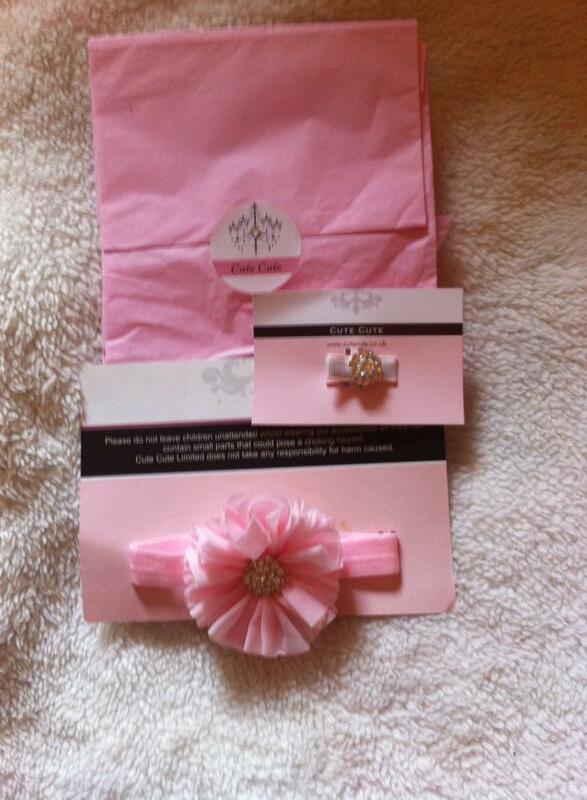 The Cute Cute Boutique is an online store filled with lovely homemade fashion accessories that will make any photo picture perfect- they provided hair bands, hair clips photo props, and loads of personalized plaques that would complete a little girls room or make great gifts for grandparents. The company has even been featured in Vogue- this little girl has more fashion sense than I do! I was so happy when my package came in the post I didn't even allow myself time to take many photo's of the beautiful wrapping because I was so desperate to see what we had received. 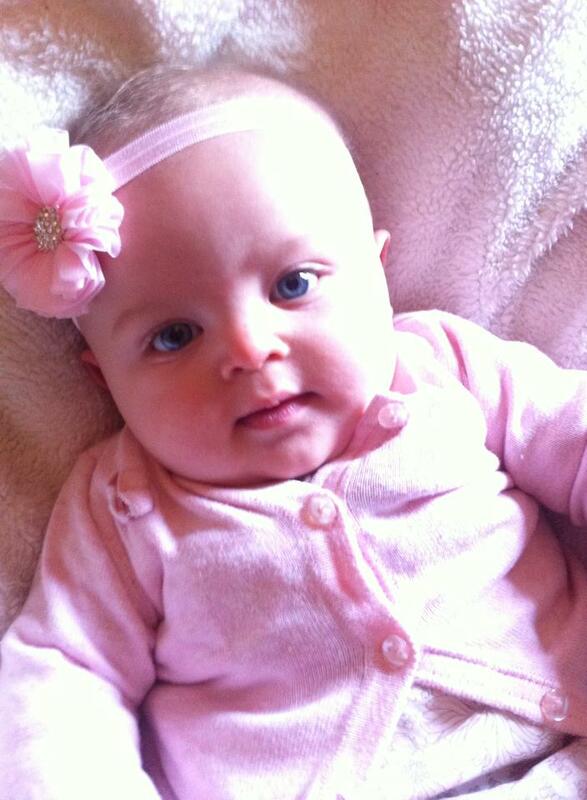 Isla was sent this beautiful handmade hairband with diamante gems which I knew right away would go with most of her dressing up clothes and look great with a day-to-day look as well. The band itself is so soft which was a relief as I've had problems in the past where I couldn't use a hairband as the elastic wasn't soft enough- babies have such sensitive heads, you don't want to put on something that is going to leave a mark or make them uncomfortable. We also received a lovely matching hair clip. Sadly Isla's hair is so thin but as soon as it starts growing I know this will be an adorable way of pushing her hair off her face and securing it. Until then I could even wear it and give this whole mummy-daughter 'twinning' fashion thing a go?! 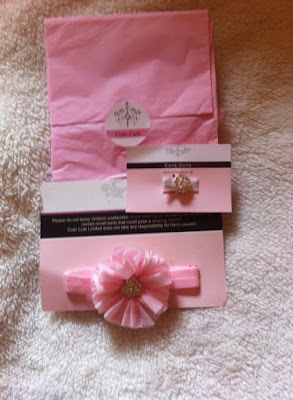 Both items came beautifully wrapped in tissue paper and were presented on cute cards from the Cute Cute Boutique. I am so grateful to the Cute Cute Boutique for sending us these bits- be prepared to see them featured in more outfits and photographs to come! I was sent one free hairband and one free hair clip in exchange for this post/review. All photographs (other than the Cute Cute logo), opinions and words are my own. Thank you Cute Cute!